Presiding over the stovetop and a hissing cauldron in the Harry’s Pizzeria kitchen, Berlin Saint-Luc is in the zone. His soup zone. Steam is billowing in fragrant plumes. You know what’s inside is going to be good. To make a simple soup you only need a few ingredients and not much time – 30 minutes if you know what you are doing, he says. Berlin describes that to make a soup it is something like combining things that match. And meat doesn’t equal flavor. You can achieve a rich meaty result by simply using vegetables and water. Berlin’s favorite style is not surprisingly a vegetable soup from his mother country. Often to help build flavor in the liquid, you start with mirepoix – the holy trinity of carrot, celery and onion. This is cooked down at the bottom of the pan before any water is added, building the stock base with browned, caramelized bits. One time Berlin’s father was very sick – stomach sick – so he made him some soup. It was basically mirepoix and garlic, so simple. His Dad drank it and one minute later he felt great. That’s the medicinal, healing power of soup for you! One of the things that Berlin learned from Manny is that you can make a great soup even in 15 minutes. An important point Berlin stresses is you never want to overcook the vegetables that are a soup’s featured ingredients. If you are making a vegetable soup at the restaurant, you always want to hold some fresh vegetables back to layer in at the end of the cooking process, like 5-10 minutes before it’s done. This finishes the soup and adds another element of texture and flavor before the final touch of garnish to please the eye. Sometimes the best soup can come from when you have nothing “juicy” to work with — the cupboard is bare and there are scraps. The night before Berlin begins thinking about the next day’s soup special. He takes an accounting of what’s in the pantry and walk-in. Then, he’s thinking about the soup at his house, no joke! He says it makes him prepared so that when he gets in and starts the soup around 9:15 a.m. the following day he’s already done the majority of the hard work. Then it’s all about following the cardinal rule: a soup man never leaves his soup. We asked Berlin to whip up a soup close to home as yesterday’s special so we could observe his morning routine, and Tess popped in to document his handiwork. 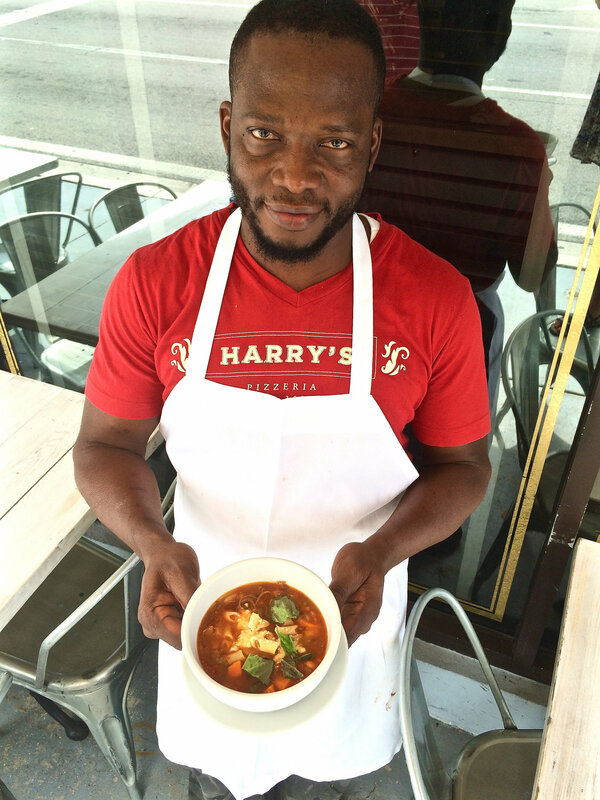 Here is the recipe he came up with so you can enjoy some soup in your own home… when you’re not visiting Harry’s Pizzeria, that is! Set a large pot on the stove over medium-high heat and fill with the olive oil. Add the celery, carrots, onion, garlic, salt and pepper and sweat until translucent, about 3-4 minutes. Add the tomato, meat and jalapeno, turn the heat to high and bring to a boil. Add the white beans, oregano, scallion, thyme, escarole and 2 quarts of water. While the soup is simmering uncovered, separately cook the pasta until al dente. Once the pasta is cooked, reserve 1 quart pasta water and add to the large pot of soup as it starts to render. Drain the pasta and rinse. Chop into rough pieces and add to the soup. Once all the flavors are blended together and everything is cooked down and tender, add the lemon juice and taste for seasoning. Ladle the soup into bowls, and top with Parmigiano and basil to finish!.